A comprehensive resource for understanding the Value Added Tax. Learn how the Value Added Tax (VAT) works and its impact on businesses. Learn about the eligibility criteria and the processes involved in VAT Registration. Learn about the different types of supply under VAT. Learn what is reverse charge, why it's important, and how it will be implemented under VAT. Learn how and when to file VAT returns. Learn how to make VAT payments. Learn about the different accounting records you must maintain under VAT. Learn how Excise Tax can determine your tax liability. Learn how you can register for Excise Tax. Learn how to transition smoothly to the VAT system. Learn how place of supply determines the tax amount owed in a transaction. Learn how time of supply determines the correct VAT period for a business transaction. Learn how value of supply determines your tax liability. Learn about the violations that lead to penalties under the VAT regime. Learn all about input tax recovery under VAT in UAE. Learn all about claiming refunds in the UAE. Learn all about designated zones in the UAE. Learn how to declare VAT while importing goods into the UAE. 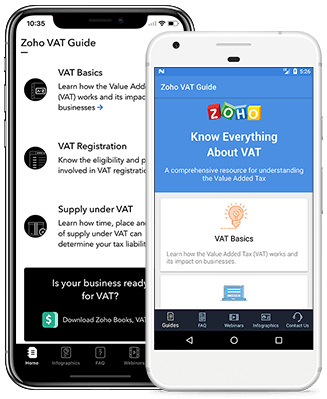 Zoho Books gives you everything you need to stay VAT compliant and manage your finances easily.